Okay everyone, I am so excited for these two movies! The clip below shows us a little insight on Russell Crowe's vocal talent and the picture is the first glimpse of the Ender's Game movie (set to come out November 1, 2013). We will have to see if the movie can compete with the second Hunger Games movie also scheduled for release that month. 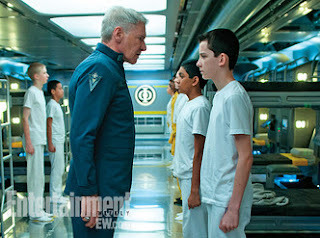 With Ben Kingsley and Harrison Ford, I have some pretty high hopes for the movie, and Asa Butterfield I think will be a great Ender. Anyway, we have a long time before that movie comes out, so let's focus back on Les Mis. Merry Christmas! Les Mis is out on the 25th of December and is going to be incredible. Its star power is unbelievable; Amanda Seyfried, Anne Hathaway, Russell Crowe, Hugh Jackman, and Helena Bonham Carter. I am currently reading the abridged version of Victor Hugo's Les Miserables (abridged, so that I can finish it before the movie comes out). I have seen the show done live, and have listened to special Broadway anniversary editions on T.V. and in French class. The story is amazing, and the songs are transcendent. Be excited and that is How Lou Sees It!